HowToRepairGuide.com: How to remove window motor and regulator on Volkswagen Car? How to remove window motor and regulator on Volkswagen Car? NOTE Removal procedure is not available. The following pertains to installation only. Insert the spreader plug and spreader pin in the window. Set the spreader plug projection evenly on each side of the window. Guide the window into the door. Lightly tap on the top of the window, so that the window locates in the lifting rail (see arrow). Install remainder in reverse order of removal. Lower the window glass and remove the door panel. Carefully peel off the door screen so that it can be reused. Raise the window enough to reach the regulator bolts, hold the glass underneath and unbolt the glass from the regulator. To remove the glass, raise the glass by hand and tilt it as necessary to remove it from the track. To remove the regulator, lower the glass carefully to the bottom of the door and remove the bolts to remove the regulator. Installation is the reverse of removal. Tighten all bolts to 61 inch. lbs. (7 Nm). Unbolt the window from the regulator and carefully lower it to the bottom of the door. Disconnect the wiring and remove the motor mounting bolts. Remove the 3 guide rail bolts and lower the motor and guide rail assembly out the bottom of the door. NOTE The upper cable must be below the guide rail mounting bracket. 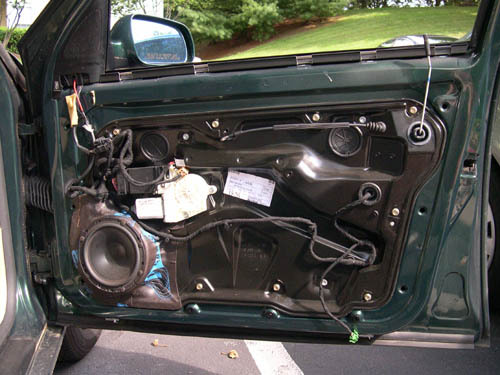 NOTE The illustration shows the removal and installation of the window regulator motor/assembly carrier with the window regulator on the rear doors. The procedure for removing and installing on the front doors is the same. Slide a hammer shaft between the window guide and the assembly carrier until the end of the hammer shaft presses against the assembly carrier. Remove the screws and take off the window regulator motor. The gearing will move when the window regulator motor is removed; it is then no longer centered. The gearing must be aligned when the window regulator motor is installed until the window regulator motor is centered again. Installation is the reverse of the removal (see illustration). NOTE The illustrations in the procedure show the replacement of the window regulator motor/carrier assembly with window regulator for rear doors. The procedure for front doors is the same. Remove the front or rear carrier assembly. Slide a hammer handle between the window guide and carrier assembly until the hammer handle end presses on the gears of the carrier assembly. Unfasten the bolts (1) and remove window regulator. When installing window regulator motor, the gears must be aligned until the window regulator motor is centered again. Attach and tighten the bolts to 3.5 Nm. The bolts must be tightened to specifications, or damage to plastic sleeve on window regulator motor can result. For replacement part carrier assemblies, the gearing is secured in place with a cable tie. Slide a hammer handle between window guide and SF so far until hammer handle end presses on gears of SF. Remove the cable tie . By removing window regulator motor, gearing shifts, it is not centered. When installing window regulator motor, gears must be aligned until window regulator motor is centered again. Attach and tighten bolts to 3.5 Nm. The bolts must be tightened to specifications, or damage to plastic sleeve on window regulator motor can result. The window regulators, the door lock and the loudspeaker are secured to the assembly carrier. The window regulator is supplied with the assembly carrier. The assembly carrier can only be removed when the door window clamping brackets of the window regulator are unscrewed. To do this lower door window to the height of the assembly holes in assembly carrier and loosen clamping brackets. If power windows cannot be lowered then the cause of the malfunction must be determined first. If necessary, make sure you have the radio code. Make sure the ignition if OFF , then disconnect the negative battery cable. Carefully unclip the handle from the armrest trim. Carefully unclip the rear section of the armrest trim with switch module up from the retainer. WARNING Make sure the retainer does not get damaged during removal. FIG : Carefully unclip the rear section of the armrest trim with switch module upwards (arrow) from the retainer (1). Detach the electrical connector (3). Unfasten the mounting screws and remove the switch module. Make sure the ignition is OFF , then disconnect the negative battery cable. Remove the door trim panel, as outlined in this section. Disconnect the electrical connector from the switch module. Bend the mounting frame out on the longer switch side, then remove the switch from the mounting frame.